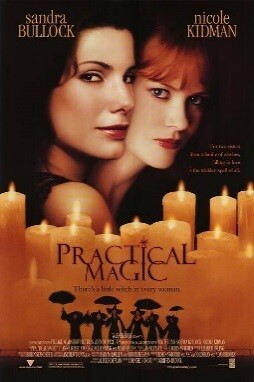 And no this is not a review of the movie Practical Magic or the performances of its leading ladies Sandra Bullock & Nicole Kidman. This will be a two part article about the Swedish Visby Class Corvette and the model which I built of this interesting ship. What is the Visby class? 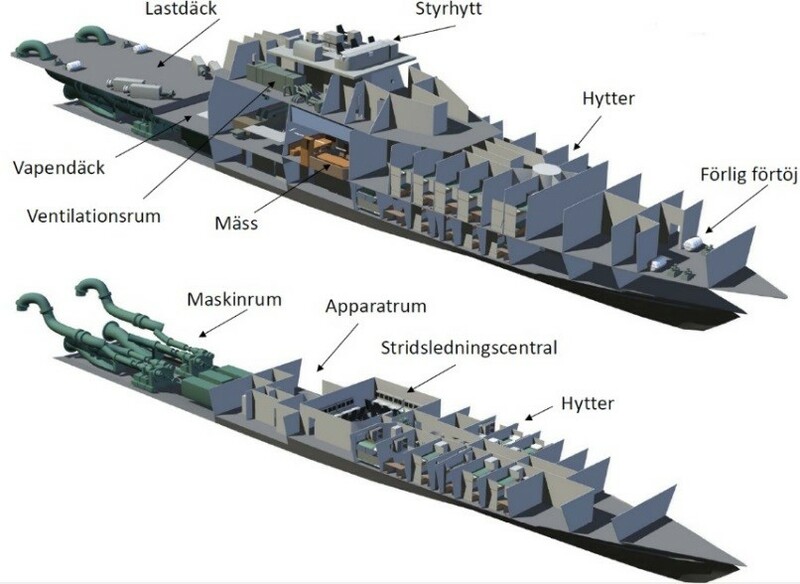 The Visby Class was developed during the cold war era and it was originally planned that the class would consist of twelve vessels, six smaller ones for coastal work and six larger ones. In the end the world changed, budgets were cut and five corvettes are now in service after a protracted and troublesome acquisition process. As such they are supposed to manage ASW, AsuW, patrols and also supplement the mine clearing ships. The Visby class is the latest class of corvette to be adopted by the Swedish Navy after the Göteborg and Stockholm-class corvettes. 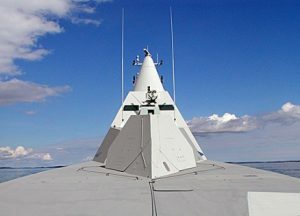 The ship’s design heavily emphasizes low visibility, radar cross-section and infrared signature. The first ship in the class is named after Visby, the main city on the island of Gotland. 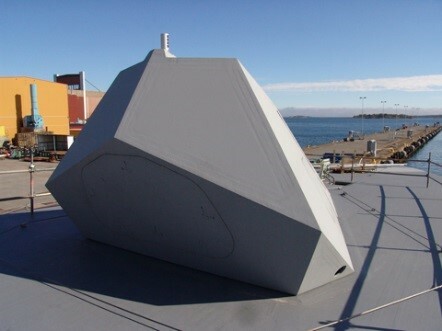 The class has received widespread international attention because of its capabilities as a stealth ship. 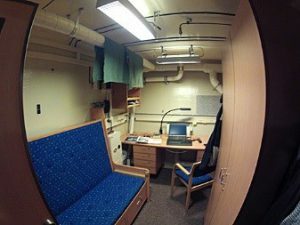 The ships are designed by Swedish Defence Materiel Administration (FMV) and built by Kockums AB, with the first ship of the class was launched in 2000 and since then the construction was fraught with repeated delays. 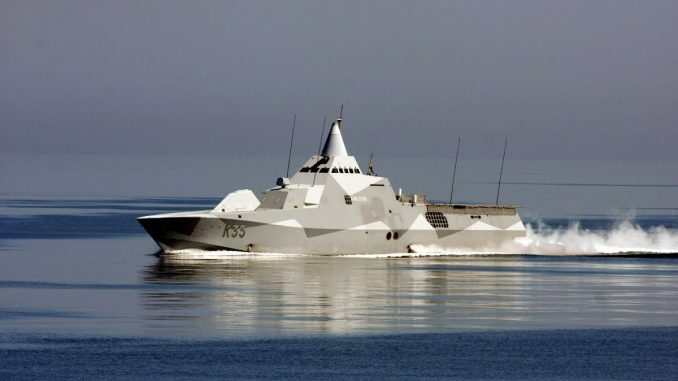 Finally in December 2009, the first two ships of the class were delivered to the Swedish Navy by the FMV, albeit with greatly reduced operational capability. 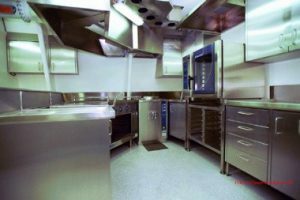 The beauty of this class is its simple clean lines, following are some of the innovations built into the external skin of the ship. The most obvious part here are the radar cross section reduction measures. 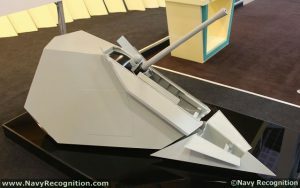 A lot of thought have gone into this, below you see the back of the 57 mm cannon which has had its shape adapted. Many less noticeable aspects include the coating of the bridge windows with indium tin oxide and gold which prevents radar returns from objects inside. 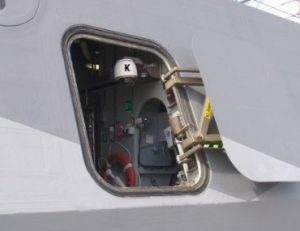 Hatches and vents are also adapted with things such as a honey comb grid which also prevents returns, while radar absorbent materials have also been added in selected areas. The antennas are retractable into the hull as are the floodlight and fog horn, and even the navigation lights have been adapted to not stand out. 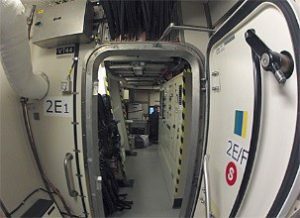 They are fitted with quadruple redundant LED lights to avoid giving off a heat signature which brings us to the next point. Great lengths have been taken to prevent the ship from being detectable with thermal imaging. 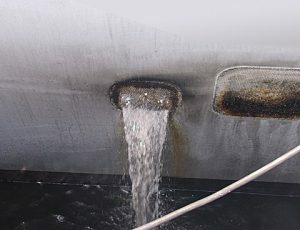 As the largest heat source are the engines and in particularly the gas turbines, the exhaust is water injected which brings down the temperature to just above room temperature before the exhaust exits the hull. 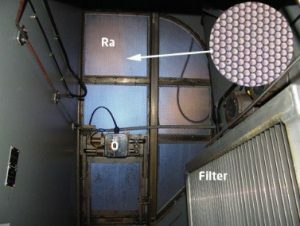 This picture shows the air intake for the low speed diesel machinery, here you can see the radar reflecting honey comb material (Ra) which the air passes through. After that it enters the filter and then on to the diesels. In case the sea waters splashes the honey comb and causes icing during the winter a pneumatic hatch below (Ö) automatically opens to allow air to continue flowing, this is however not stealthy. 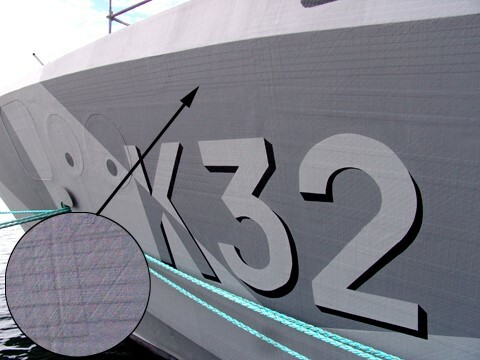 The paint of the ship’s hull has also been specifically developed to reduce the IR signature. 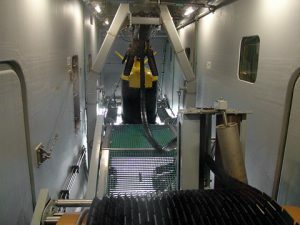 Due to the specified role as a supporting mine clearing vessel the ship has been fitted with an extensive degaussing equipment which renders it without a magnetic signature detectable by a mine. 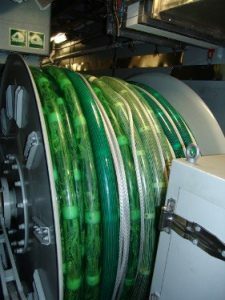 This is achieved by fitting degaussing coils throughout the ship which compensates for the magnetic signature of the on-board equipment. These are laid out in an X, Y and Z grid – the equipment also measures the earth’s magnetic field and compensates for this by adjusting the power to the degaussing system. The larger coils can however only manage the ship as a whole. 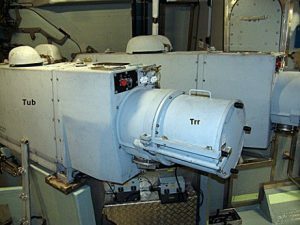 There are specific steel objects that needs separate degaussing setups fitted. Engines, generators and gearboxes among other things. As with the other areas of the class a lot of effort has gone into reducing the acoustic noises propagated through the water. This has been successful to the point that “equipment to hide actual acoustic signature” has been fitted for peacetime use. The acoustic signature is measured with the towed array sonar to ensure that nothing has started to make noises. So how stealthy is it in practice? Exact figures are classified but as far as radar goes it is generally not detectable by normal search radars when operating in full stealth mode. This has caused problems at times since although radar reflectors are fitted they are to the aft and obscured by the superstructure from certain angles which leads to confusion when only the AIS signature and no primary radar returns can be detected by others. 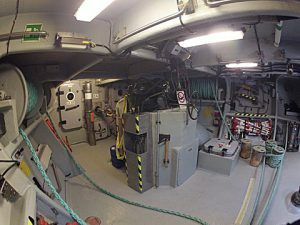 Acoustically it has been noted that submarines have much greater issues detecting the ships than they have with those of other classes. It is in basically a composite design of carbon fibre reinforced plastic (CFRP) with an exterior carbon fibre laminate, a middle section of divinycell – which is a light weight material – and more carbon fibre on the inside. This material reduces the hull weight significantly, down to about 50% of an equivalent steel hull. The carbon fibre conducts electricity which is both good and bad. Good in that it provides shielding of radio signals and bad in that it creates galvanic corrosion. Most of the hull is built with vacuum injected laminate and the rest is hand fitted. The ships were built in three sections which were then joined together. The hull has been designed so as to be able to negotiate a mine detonation under the keel without snapping. 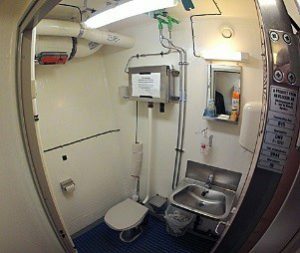 To aid in damage control and general operations stress load sensors are fitted throughout the hull, these allow the crew to assess the hulls integrity and make decisions based on it. Below you see a cut through which demonstrates the structure and general layout. 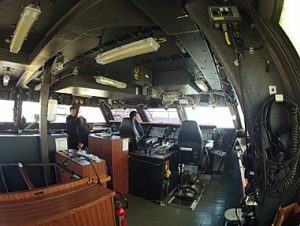 To the stern is the engine room, cargo deck, weapons deck then we have the messes below the bridge and above the CIC, then crew quarters and mooring station. 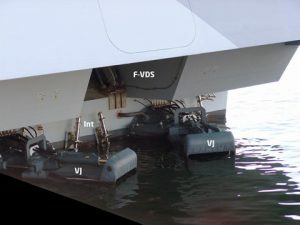 Due to the layout of the ship and lack of bridge wings the view is obscured when mooring, therefore four dome cameras (see red arrow) are mounted inside the mooring hatches which allows the bridge crew to see properly during mooring. The beauty of this ship is how and what has been packaged into its hull, following is something which is rarely seen the magic beneath the skin. In the bow of the ship you find an anchor, situated behind a hatch. 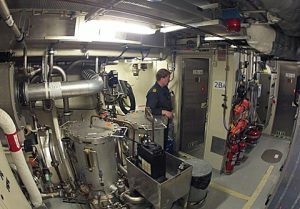 This photo shows one of the mooring stations located around the ship and hidden behind yet more hatches. 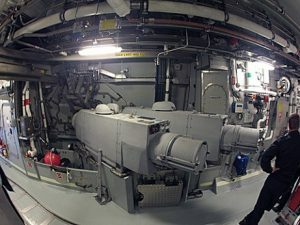 Seen to the right is the replenishment at sea station – located internally, the metal containers in the middle are fuel filters for the system, and yes you guessed it behind another hatch. The Towed Array Sonar has a length of 1,300 meters and has microphones set at one meter intervals. The Visby Class have an active and a passive component and can be lowered to a depth of 100 meters. 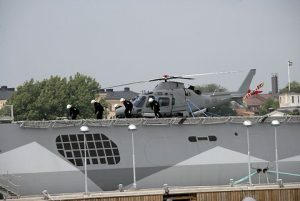 It is seen here in its stored position located between and above the water jets. 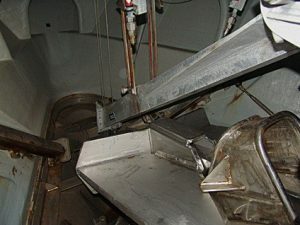 This photo shows the opening to the 57 mm Bofors cannon, these panels conceal the barrel of the gun, the second photo shows how a fully deployed gun would look, of interest is the spilt gun casing, which allows the gun to rotate unobstructed. 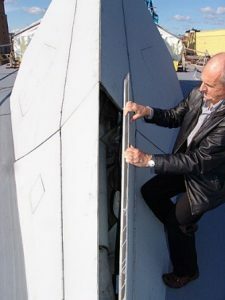 Shown is the hatch for the torpedoes which preserves the radar signature, once fired the hatch closes and only the small portion marked with white remains open for the guide wire. 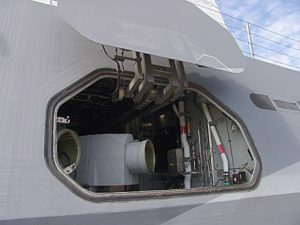 ASW 400mm torpedoes, designated Torped 45 are used, shown in these two photos are the launchers note that they launch backwards. 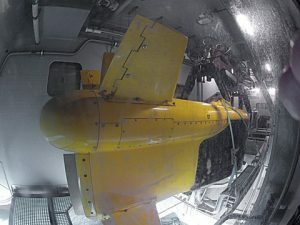 The yellow vessel in the middle is the large ROV-S which is used for inspection of mines and submarines, below it are the tubes for the four RBS-15 SSMs carried, two pointing to each side and behind it is the ships boat. 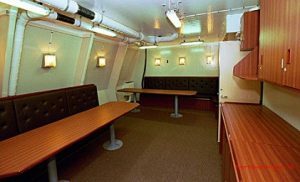 Here are a few photos of the crew areas, if you need natural light and get claustrophobia this ship is not for you – sloping walls and no windows! Helicopter landing area, the railing drops automatically and is stored away completely when in stealth mode. There was planned to have a hangar below the flight deck reached by an elevator platform, it proved impossible to fit in the limited space available. In part 2 I will describe and show what I did in building my model of HMS Karlstad K35.